The National Agriculture and Trade Show (NATS) Committee under the auspices of the Ministry of Agriculture, Fisheries, Forestry, the Environment and Sustainable Development hereby announces the dates for the NATS 2017 as the 28th, 29th, and 30th of April. The event will be celebrated under the theme “Let’s Get Growing”. Preparation of the grounds is currently under way and the committee informs all interested persons that the reservation and sale of concession stands, food stalls, open spots and commercial booths have commenced. Right of first refusal will be granted to 2016 lease holders and as such those vendors will have until March 17, 2017 to confirm their desire to re-establish their booth leases. Those vendors are being asked to contact the Ministry for information on deposit of payment and signing of Lease Agreement. This preference exists EXCEPT where there was a reconfiguration of the grounds and/or removal of booths, in which case that space is no longer available for sale. Effective Monday, March 20, 2017 potential new vendors, or those wishing to relocate to a new location, will be invited to visit the NATS Headquarters (located on the show grounds) to view available spaces and complete the necessary transactions, if so desired. Vendors with down payments will have until April 14, 2017 to complete their payments after which that deposit becomes non-refundable. • Mr. Andrew Mejia – Ministry of Agriculture, Fisheries, Forestry, the Environment, Sustainable Development and Immigration. 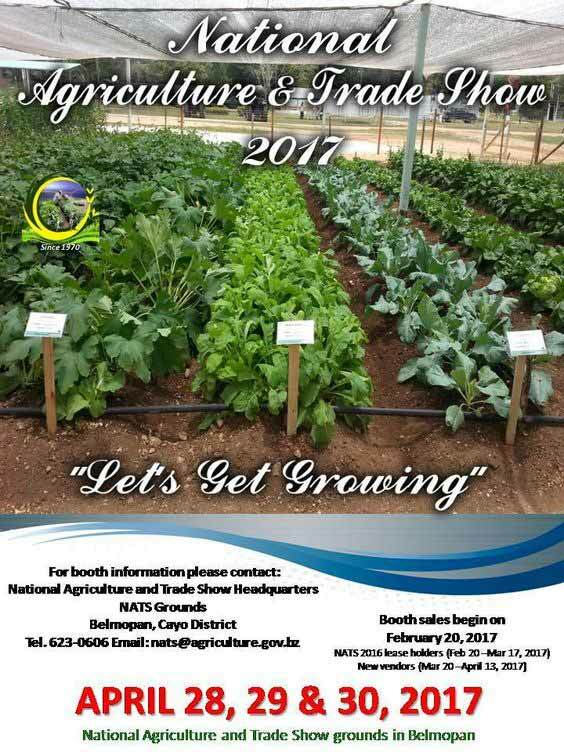 The NATS Committee reminds the public that this year’s event is scheduled for the 28th, 29th, and 30th of April, 2017, under the theme “Let’s Get Growing”. Fourteen days to the start of the biggest and best show in Belize, the place where we all meet our friends, see productive sector displays and enough entertainment for the entire family! April 28-30,2017, see you there!!!!! 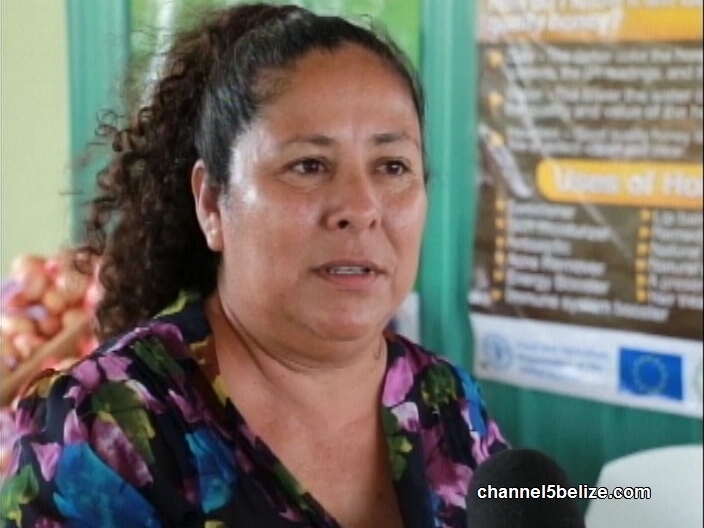 All roads will be leading to the Agricultural Show grounds near Roaring Creek Village in the Cayo District this coming Friday and weekend. Belize’s largest show is now in full preparatory stage and about to bring endless joy to many across the Country. Chairman of the NATS Committee Gary Ramirez says that the show promises to attract large crowds and bring family and friends together. “When you come to the show grounds you will run into a few long lost friends,” he says. 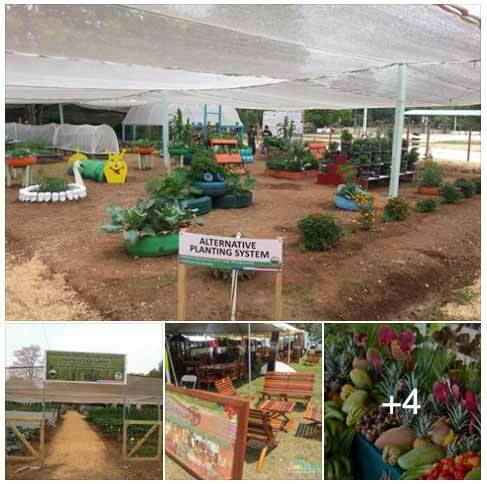 At the agricultural show grounds itself, suitably located at the entrance to Belmopan, there has been significant improvements to the grounds. There are now new public restrooms, which during the show, will have assistants on standby. 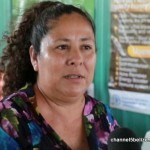 There is also a new market facility on the show grounds, which will now be a weekend market for Belmopan thanks to funding from the United Nations Development Program and other donor organizations. As in previous years, there will be zoning on the show grounds such as for electronics, mechanical rides and foods. As a reminder, the agricultural show starts at the agricultural show grounds at 12:00 pm this Friday. Official ceremonies have been scheduled to start on the main stage on Friday at 3:00 pm where the three farmers of the year will be sashed. Male Farmer of the Year, Gary Canto; Female Farmer of the Year, Ms. Mirva Flowers and Junior Farmer of the Year Santiago Gutierrez will also be awarded at 10:00 am on Saturday. Organizers of NATS are aiming for 43,000 visitors this year having welcomed 39,000 visitors last year. But it has not always been just about a show of numbers as each visitor is special; bringing with them a new boost to the agricultural show. As explained by Gary Ramirez, the profits made at the show goes back to the improvements of the show grounds itself. As a starter, NATS now has its headquarters at the show grounds. 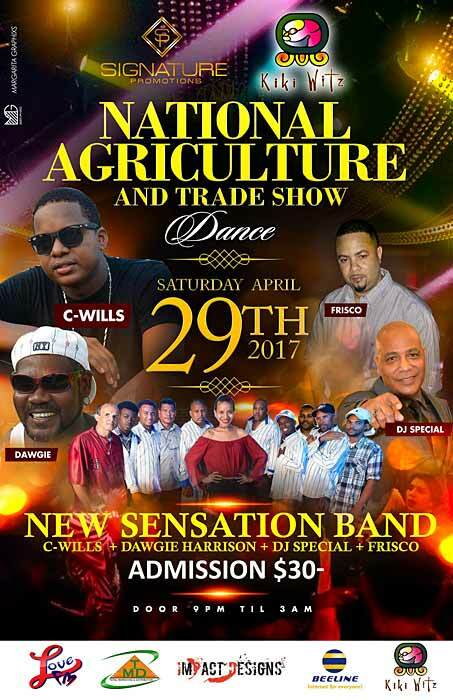 Those who want to be a part of the show can now visit the NATS office there rather than going to the Ministry of Agriculture in Belmopan. 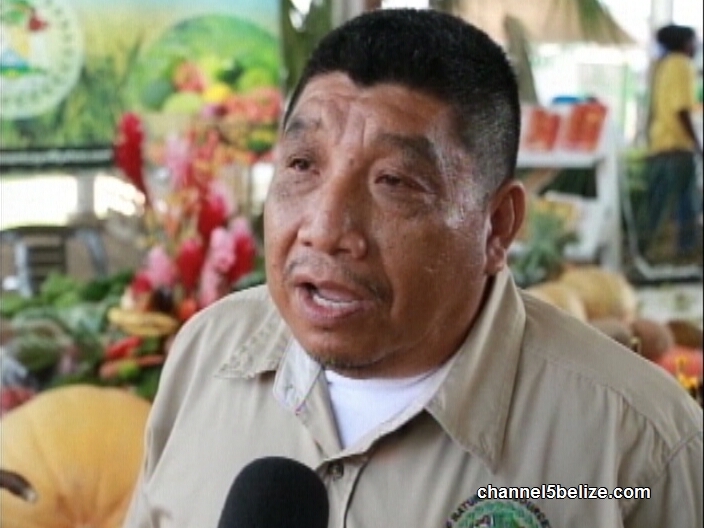 “The Ministry of Agriculture’s new office and new headquarters will also be on the show grounds in a very short time,” adds Gary Ramirez. 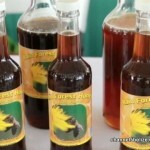 The 47th National Agriculture and Trade Show was officially opened on Friday, April 28 on the showgrounds in Belmopan. On Saturday and Sunday, the trade and commerce went into full swing as dozens of private and public businesses occupied the booths with bargains, deals and marketing strategies. Love News spoke with the Chairperson of the NATS committee, Gary Ramirez for a preliminary report on the show. 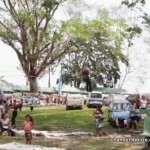 The Ministry of Agriculture has confirmed that the visitors to the show amounted to about thirty seven thousand with the majority of that figure coming out on Sunday. 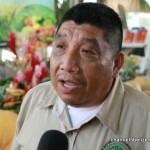 According to CEO for Agriculture, Jose Alpuche, this year’s visitors exceeded last year’s by an estimated two thousand. The Ministry of Agriculture, Fisheries, Forestry, The Environment, Sustainable Development and Immigration wishes to thank the visiting public, the exhibitors, our sponsors and all the support personnel who made the 2017 National Agriculture and Trade Show a resounding success. The NATS Committee reports 37,143 attendees, this represents an 8.28% increase over 2016 attendance of 34,304. On Saturday, April 29, 2017, attendance was 15,107 compared to 13,982 in 2016 and on Sunday, April 30, 2017, attendance was 22,036 compared to 20,304 in 2016, an increase of 9.98%. Gross income for the show this year was $284,000 which represents an increase of over $12,000 compared to 2016. The economic activity generated by the show has increased considerably as we had many new businesses attending and a marked increase of agriculture-oriented exhibitors. The Ministry will continue to invest in the improvement of the National Agriculture and Trade Show Grounds to increase its use throughout the year. The show occurred without major incident and has truly become a family oriented event. The Ministry wishes to thank the NATS Committee and the entire team of the Ministry and our many collaborators that prepared for and executed the show. We look forward to hosting NATS 2018 and tentative dates are April 27, 28 and 29, 2018. 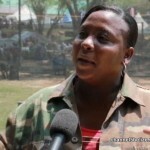 The National Agricultural and Trade Show, better known as Agric, got off over the weekend. The annual event provides a space for the productive sector to meet with its customers and potential buyers of the various items that were on display. 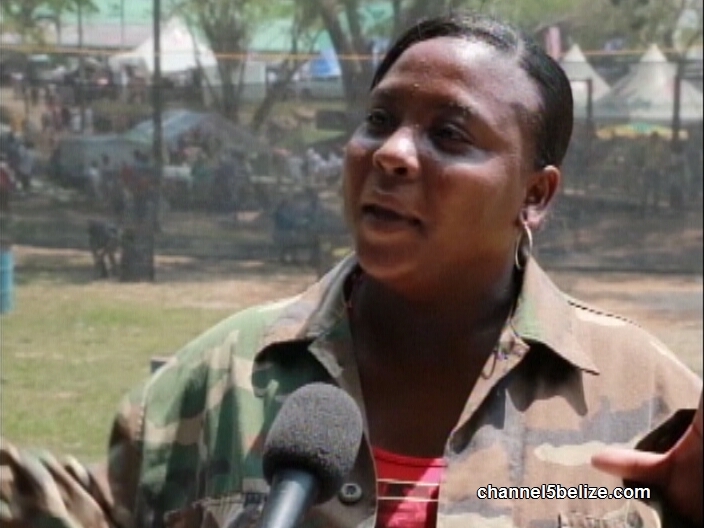 News Five’s Duane Moody reports from Belmopan. 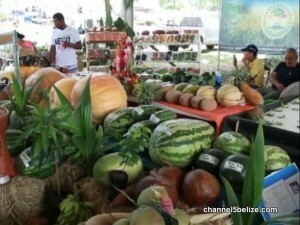 The sweltering heat over the extended weekend did not deter Belizeans, from all over the country, from making their way to the Capital City of Belmopan where the 2017 National Agricultural and Trade Show got off. According to the NATS Committee over thirty-seven thousand persons attended the show grounds this year around, which represents an eight point two-eight percent increase over last year’s figures. 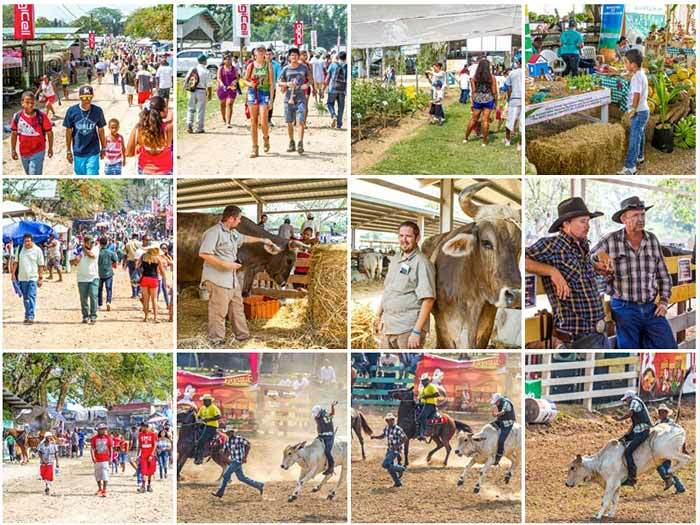 The ‘Agric,’ which showcases businesses as well as the products of domestic farming and production, has over the years truly become a family oriented event and there was no shortage of food and drinks as well as entertainment. Cavetubing.bz came out in full force, providing attendees with an experience of a lifetime. Ziplining above, adults and children alike were strapped up for safety and zipped across the lines just below the canopy. Over at the family fun zone adventure, paintball shooting was also a hit. Before you start the game, you’re dressed in full body and face protection to avoid anyone getting hurt. There was a wide variety of agricultural produce represented from the length and breadth of the country; some larger than ever. The theme for the Central Farm Branch of the Ministry of Agriculture was “Transferring Information and Technologies,” to showcase the industry as an income generation activity to all farmers. For the second time in a row, the booth showcased the largest pumpkin and watermelon. Honey production is an intricate business: hives are harnessed, the sugary sap extracted and then used to create wax and one hundred percent honey. 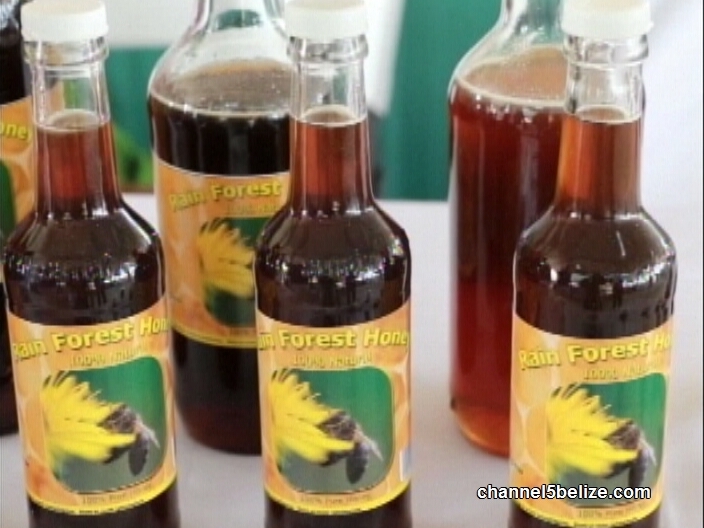 For about eight years now, Iliana Ayuso and her family in Orange Walk have been harvesting the honey cones filled to capacity by the African bees before bottling the honey to meet the demands of customers. The two-day event occurred without major incident. Enjoy some highlights from this year's National Agriculture & Trade Show Grounds in Belmopan, Belize.